Adalita recently revealed the release date for her second solo album, All Day Venus – this coming September 20. Now, further good news is at hand for fans of the Melbourne artist. 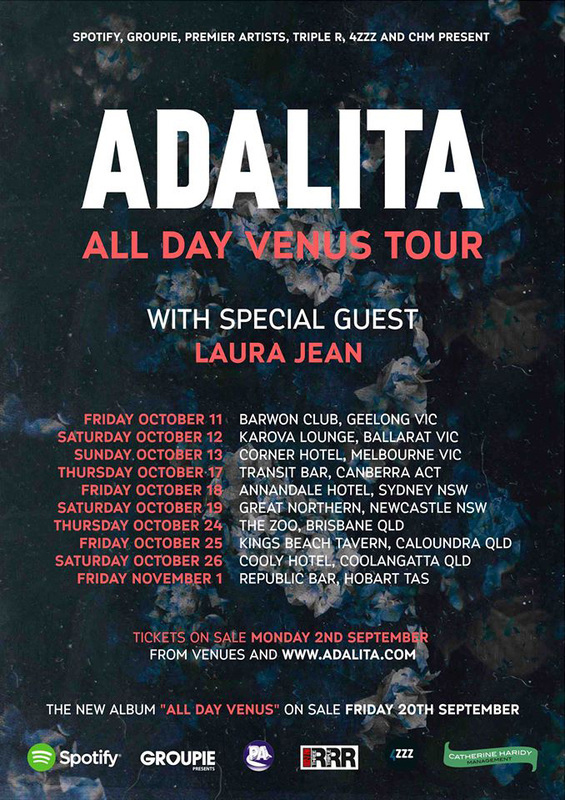 Following the album’s release, Adalita will hit the road for a headline tour. The tour will take Adalita to major metro and regional locations along Australia’s east coast. It will provide the first opportunity for fans to see Adalita playing her new material with a full band. The band line-up includes ex Paradise Motel bassist Matt Bailey. In addition to the east coast tour dates, Adalita will also perform a solo show in Adelaide. Said album, All Day Venus, was recorded with acclaimed local producer Lindsay Gravina. Featuring twelve fresh songs, including the album’s title track All Day Venus and the current single Warm Like You, the album was borne from periods of intense creativity and personal reflection; the songs dark, brooding and unflinchingly honest, bursting with energy. Opening for Adalita on the tour will be indie songstress, Laura Jean – her charming folk tunes being the perfect accompaniment to Adalita’s music. Tickets for the All Day Venus tour go on-sale next Monday September 2. For details, head to www.adalita.com. Adalita’s self-titled solo debut won critical acclaim upon release, ultimately scooping the coveted AIR Award that year for Best Independent Album. All Day Venus is a vastly different offering, but one that is sure to similarly impress. It’s out 20th September. Tickets on sale Monday September 2.